It’s hard to believe that two weeks have gone already! The time in Miami really was a great time! In fact, I feel like we not only enjoyed ourselves very well but we were able to see God move in some very definite ways. 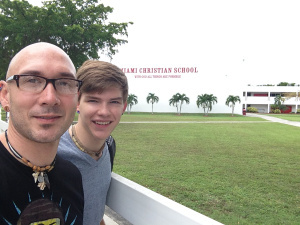 The time at Miami Christian ended well with us performing several songs for the middle and high school students. Many of the students were not familiar with our songs at the beginning of the week but by the end, some were not only asking for the songs but singing right along in worship!